Wilmington Business Development is a private, not-for-profit organization designed to assist and make company’s expansion/relocation efforts seamless. Wilmington Business Development serves the Greater Wilmington, North Carolina region—New Hanover and Pender Counties and the City of Wilmington. A sampling of our turnkey site selection assistance includes confidential assistance with industrial expansion and relocation. We act as a business, government and utility liaison providing demographic and economic data. We provide site selection assistance. Although tasked with bringing investment and quality jobs to the Greater Wilmington Region, WBD is not an employment services organization. For information about potential job opportunities we suggest that you visit the North Carolina Department of Commerce’s Division of Employment Security. 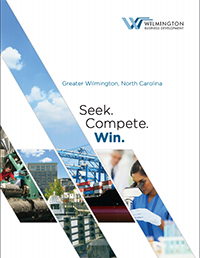 Wilmington Business Development’s (WBD) mission is to promote a diversified regional economy through the retention and growth of existing employers and the recruitment of responsible business investment. Promote: WBD will actively engage in ally, investor and partnership development, outreach and education that effectively promote and improve the region, its economic assets, business interests and quality-of-life. Ally, Investor and Partnership Development – In order to promote the region in the most effective and efficient way, WBD will forge constructive relationships with allies, investors and partners inside and outside the region, including economic development organizations, educational providers, governmental and quasi-governmental agencies, chambers of commerce, commercial real estate professionals and site selection consultants. Outreach and Education – WBD will focus communications, media engagement and relationship-building activities on audiences and stakeholders in the region to inform and educate the general public on the importance of a competitive business climate and a growing, diversified regional economy. Retain: WBD will endeavor to support the existing businesses of Greater Wilmington and the jobs they represent. Feedback and Intelligence Gathering – WBD will seek input from existing businesses about their strategic business needs and how the organization and region can facilitate their ongoing success. Location Service Delivery – WBD will provide confidential, high-quality project management assistance to existing businesses undertaking expansion or consolidation plans. Resource Development and Coordination – WBD will seek to develop and coordinate resources needed by existing businesses in the region in order to meet their needs and retain them in the region. Recruit: WBD will aggressively deploy outreach tools to showcase Greater Wilmington as a destination for high-quality economic investors. Market Intelligence – WBD will perform or obtain credible research and economic analyses upon which to base its global marketing strategies, outreach tools and recruitment programs. Lead Generation and Client Development – WBD staff will collaborate with its members, partners and allies to gather qualified leads and establish client contact in target industries. Project Management and Technical Assistance – WBD will assist clients and consultants and encourage them to select Greater Wilmington as an expansion, relocation or start-up destination. Involvement of Public Partners – WBD will engage its public partners in the region, including municipalities, universities, community colleges and school systems to further economic development objectives. Founded in 1956, WBD (then known as Wilmington Industrial Development) was formed by prominent businessmen with the idea in mind to aggressively recruit business and industry to the Wilmington region. A cutting edge idea at the time that was born more of necessity than strategic planning due to the relocation of the Atlantic Coastline Railroad from Wilmington to Jacksonville Florida. When the relocation occurred more than 300 families left the area which prompted the need to recruit new business and industry to replace the lost jobs. Over the ensuing decades, several industrial titans were recruited to the area to include General Electric, Corning, International Paper and DuPont. Infrastructure also improved over time to include an international airport (ILM) an enhanced Port terminal at the Port of Wilmington with 42′ deep channel and the ability to handle container, bulk and breakbulk goods. But it was the completion of I-40 in the early nineties that really took Greater Wilmington and the entire region to all new heights. In the past two decades the region has experienced tremendous growth both in people and in business. Now home to GE Hitachi’s Global Nuclear Headquarters, GE Aviation, PPD (one of the largest Clinical Research organizations in the world) and a financial services center for Verizon Wireless, Wilmington has become a major player in the world of business recruitment. WBD is now poised to take the region into the next two decades as it focuses its efforts on target industries that are expected to see rapid growth in the 21st century. A public private partnership, WBD provides economic development services through contractual relationships with New Hanover County, Pender County and the City of Wilmington. The organization is majority funded by the private sector through membership, an annual Golf Tournament and various other opportunities for sponsorship.